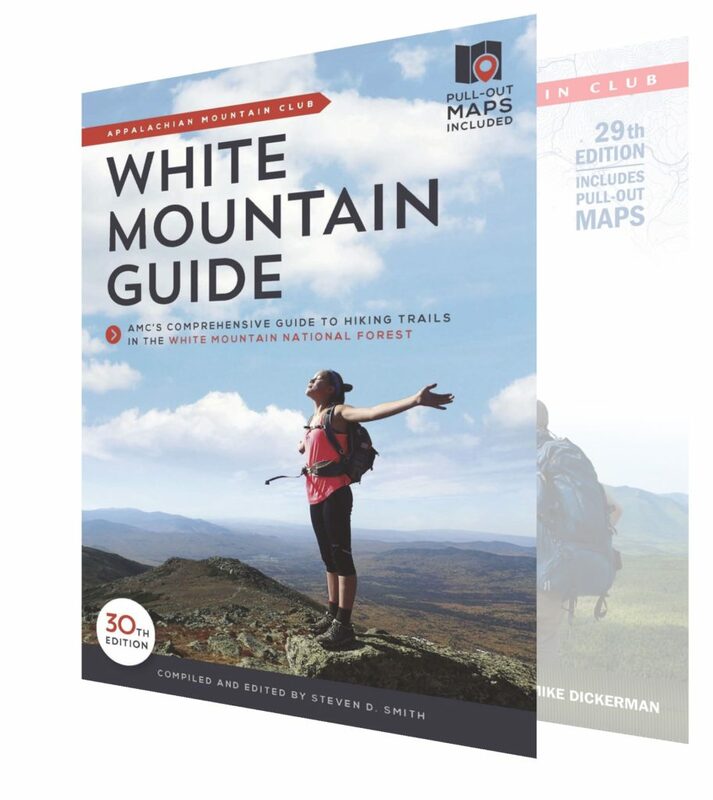 We asked Steve Smith, Compiler and Editor of the AMC’s White Mountain Guide and owner of the Mountain Wanderer Book Store, if there was a list of the new trails, closures, relocations, etc., printed somewhere in the new book. We figured those wanting to check out the latest and greatest the National Forest has to offer, people like us, would really love to have this specific kind of information. Cabin Trail (Red Hill) — 1.4 miles. Irene’s Path (Waterville, replacing closed Flume Brook Trail) — 1.1 miles. Lone Oak Trail (outside Woodsville) — 0.8 miles. Pond Brook Falls Trail (Cohos north of Percys) — 0.7 miles. Trio Trail (Cohos north of Percys) — 3.2 miles. Peek Path (Randolph Hill) — 0.7 miles. Crystal Mine Trail (Randolph) — 2.0 miles. Rollo Fall Path (Randolph) — 0.4 miles. Pine Mountain Loop (bypassing Horton Center) — 0.2 miles. Bald Cap Peak Ledges Trail (awesome viewpoint in Shelburne) — 0.5 miles. Judson Pond Trail (Shelburne) — 0.4 miles. Mt Jasper Trail (Berlin) — 0.7 miles. Maggie’s Run (Crawford Notch) — 1.4 miles. West Side Trail (Crawford Notch) — 1.2 miles. Frankenstein Cutoff (Crawford Notch; very short, but makes an Arethusa-Ripley loop more feasible) — 0.1 miles. Old Waterville Road (Smarts Brook) — 2.5 miles. Cooley-Jericho Community Forest Trails (Easton/Franconia) — 3.0 miles. Update: Download printable list PDF. Quincy Pasture Forest Trails (near Stinson Mtn.). East Side Trail in Nash Stream (better description). Deer Mountain Trail in Pittsburg (info obtained from others). Bill Hastings Memorial Trail (Shelburne). Community Forest Interpretive Trail (Randolph). Mittersill-Cannon Hiking Trail (currently closed due to construction). Short trail to Lower Falls of the Ammonoosuc (Cherry-Dartmouth region). Wildlife Pond Trail (under Trestle Trail, near the Sugarloaves). Dry River Trail (plus start of Mt. Clinton Trail). Albany Mountain Trail (plus better description of path to SW view ledges). Bog Brook Trail (new trailhead). Mahoosuc Trail (N ridge of Goose Eye). Guinea Pond Trail (highwater bypass). Doublehead Ski Trail (new trailhead). A massive blowdown on Kate Sleeper Trail. Bridge gone on Moriah Brook Trail. Cable car on Yellow Trail in Shelburne [best crossing ever]. New bog bridges on Church Pond Trail. And others he says he’s probably forgetting. Plus tweaks on various other trail descriptions and data. As an aside, the book’s index has increased from 11 to 18 pages better assuring what you’re looking for is found. Thanks for providing this data, Steve, and for compiling and editing one of our favorite books.